My best friend’s daughter turned one year old last weekend and I made up a batch of these edible flower lollipops to give away as favors for her floral-themed party. The guests were amazed by how these turned out and many were surprised to learn that violas are actually edible. Edible flowers are all the rage. They are tasty, of course, but what they can add to a garden party is truly eye-catching. 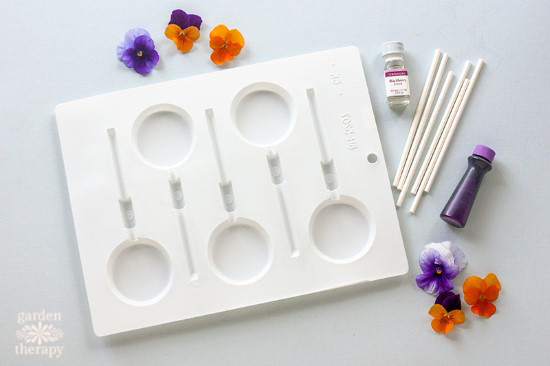 Crafting beautiful blooms into these edible flower lollipops is easier than you think. And your friends or party guests will be a sucker for them! 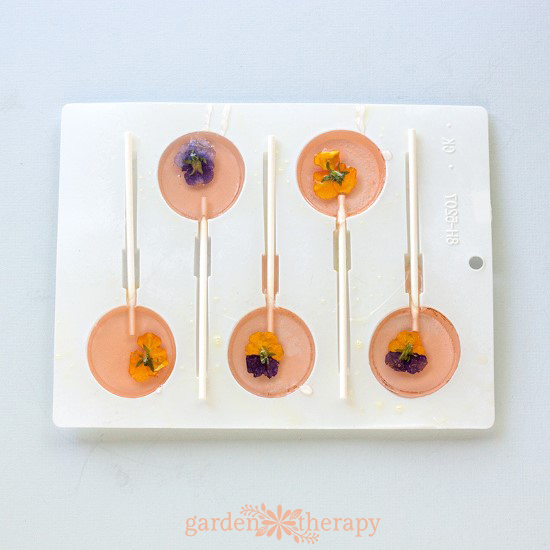 Celebrate the blooming flowers of the season by making these edible flower lollipops for your next party. 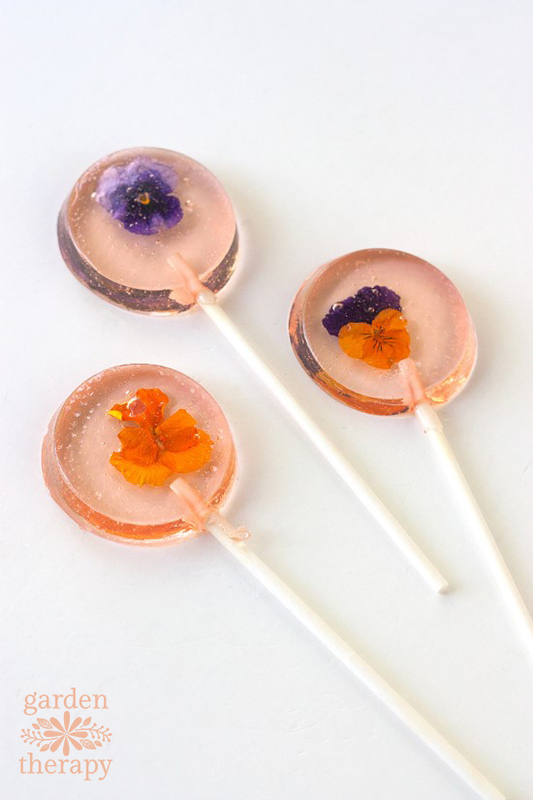 Simply pluck a few violas from your garden and let’s make lollies. Choose flowers that will fit your mold shape. 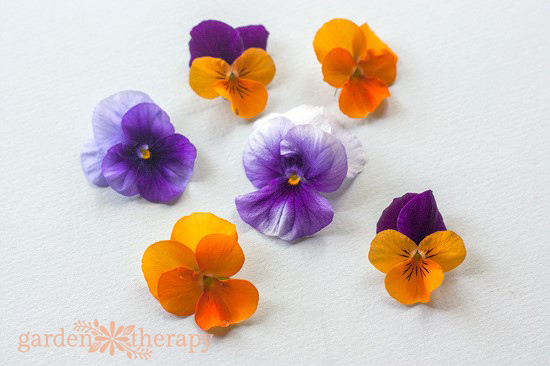 Only use edible flowers that you can identify correctly. 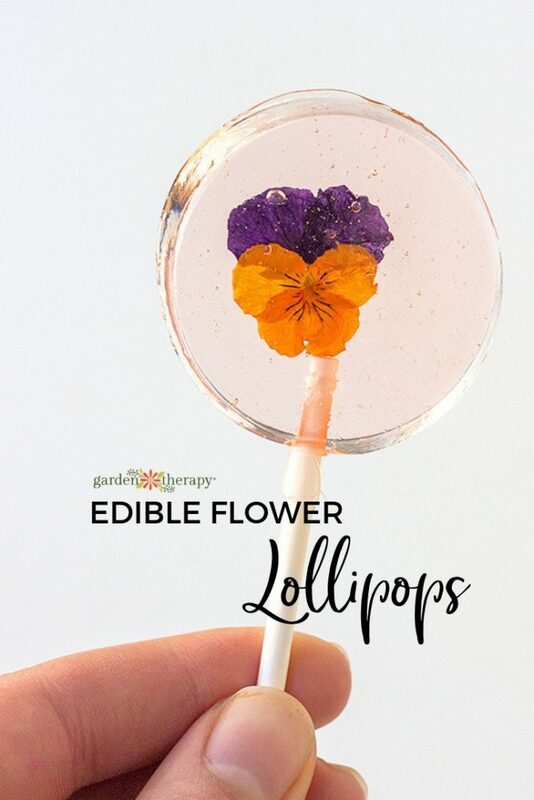 Small-size edible flower suggestions for lollipops: Chamomile, Borage, Lavender, Marigolds, Pansies, Rose Petals, Violets. 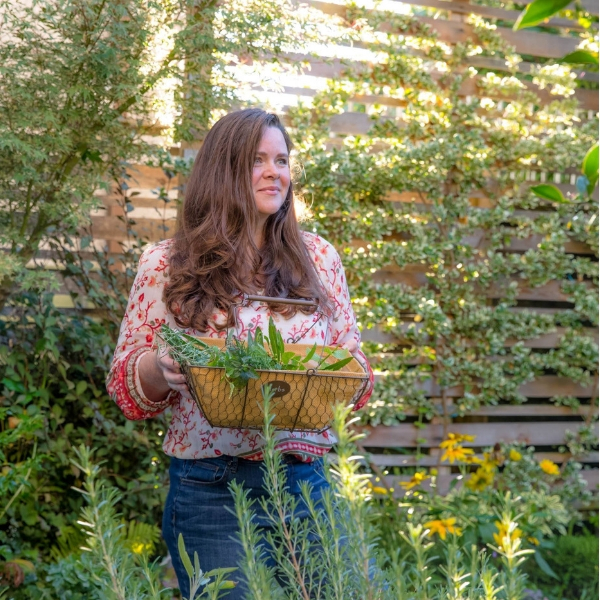 Read more on edible flowers here: The Dirt on Edible Flowers (and the Top Ten You Must Try!) 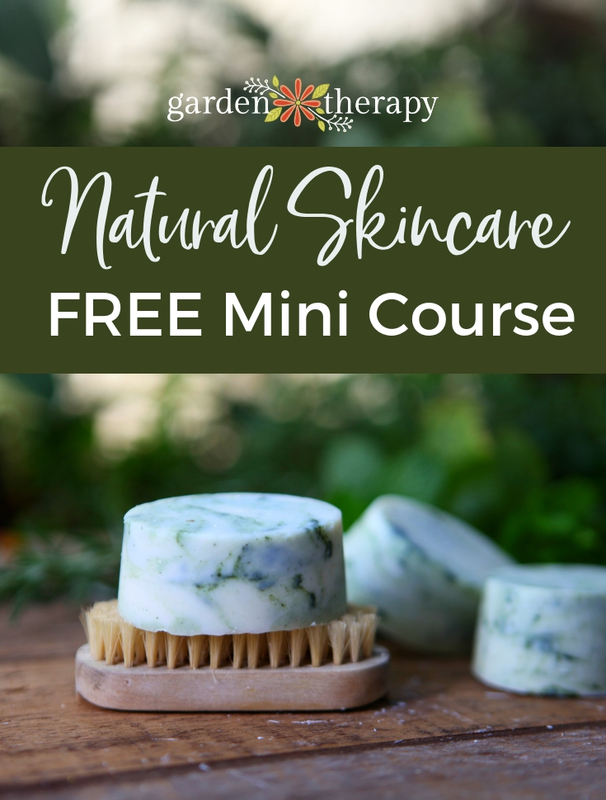 and Edible Wildflowers: Grow it! Eat it! *Note: Make sure to use a mold that is made for hard candy. Most of the clear plastic molds are meant for chocolate or other low-temperature candies. Hard candy needs to get up to 302 degrees F and will be too hot for some molds. Spray your mold with cooking spray and set aside. In a small saucepan, stir together the sugar, corn syrup, and water. Clip the candy thermometer to the side of the pan. Bring mixture to a boil over high heat. Continue to heat without stirring until the bubbling mixture reaches the hard-crack stage (302 degrees F). Remove the pan from heat and stir in the flavoring and a very small amount of gel food coloring. Note: I ruined my first batch by adding too much food coloring to my candy. Because the flowers are the main feature, I wanted a pale color that would compliment the flowers. I would recommend adding in a tiny amount (rice-grain size) of the food coloring at a time until you reach your desired color. Once the mixture has stopped bubbling, use a metal spoon to drop it into the molds. Carefully place a flower face down onto the candy. You can use the end of a lollipop stick to slightly press the flower into place. Quickly spoon just enough hot candy over the top of the flower to cover it completely. Place a lollipop stick into the candy and rotate about ½ turn. Allow the candy to harden completely, and then remove from the molds. Beautiful idea, we would like to make these as wedding favours , I,m just wondering how long in advance do you think you could make them and how would you store them.